IRVING, Texas – The Big 12 Conference office announced the 2017 league football schedule on Tuesday afternoon. The conference slate will begin on the road for the second straight year, as they Longhorns will travel to Ames, Iowa for a matchup with the Cyclones of Iowa State on Sept. 30. UT defeated Iowa State 27-6 at home in 2016. 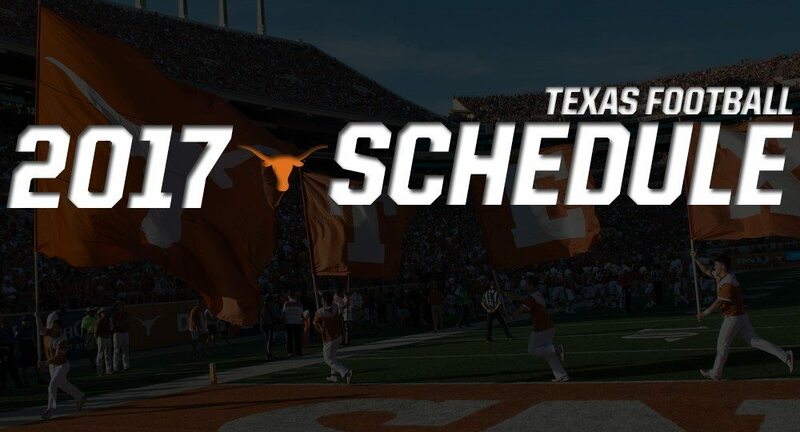 The home portion of the conference schedule begins the following week when Texas welcomes Kansas State to Darrell K Royal – Texas Memorial Stadium on Oct. 7. Texas will meet Oklahoma in the annual AT&T Red River Showdown on Oct. 14 in Dallas. The Longhorns also host Oklahoma State (Oct. 21), Kansas (Nov. 11) and Texas Tech (Nov. 25) in 2017 Big 12 action. Besides Iowa State, Texas will travel to Baylor (Oct. 28), TCU (Nov. 4) and West Virginia (Nov. 18) in 2017 during league action. The Tom Herman era will begin with three non-conference games. UT will host Maryland in the season opener on Sept. 2, renewing the series with the Terrapins for the first time since 1978. The Longhorns lead the all-time series 3-0. The next week, Texas hosts San Jose State (Sept. 9) for the first matchup between the Longhorns and Spartans in school history. Following the two home games to begin the season, UT travels to Southern California for a showdown with the Trojans. It will be the first meeting between the two schools since the 2005 National Championship Game. The Big 12 Conference Championship Game will be played on Dec. 2, 2017 at AT&T Stadium in Arlington, Texas. The game will pit the conference's top two teams against one another. All games are subject to change.